The severe blow dealt by the European Court of Justice’s ruling to management at Austrian Airlines (Tyrolean) – a fully-owned subsidiary of Lufthansa Group – that they cannot negotiate an agreement with the works council on the basis of a Tyrolean deal (rather than the more generous old Austrian Airlines one) means that the management have decided to set aside provisions of up to 99 million Euro depending on how tough the negotiations will be with representatives of its employees. This poses a real dilemma for the management at Austrian and ultimately their owners at LH Group. What are the tactical options available now that the cost savings projected by the Tyrolean ‘hive down’ is no longer possible? While they may not get all the cost savings, management could ‘threaten’ the staff that failure to negotiate a lower cost deal will ultimately force Austrian Airlines (Tyrolean) out of business leading to huge job losses. This may bring the labour unions to compromise. (b) Transform Austrian from being a FSC to becoming a hybrid carrier with an emphasis on budget pricing. Their long haul fleet could be returned to the lessors and Lufthansa could operate long haul flights out of Vienna using their extensive wide-body fleet. There is a precedent. Aer Lingus, Ireland’s flag carrier, undertook a massive restructuring in 2009 seeking to eliminate more than 95 million Euro in costs by ending ‘legacy work practices enabling it to compete more effectively against a peer group with significantly lower operating costs’. They did this partly by simplifying the fleet, increasing seat density, reducing turnaround times at airports and so on. Unfortunately the evidence is mixed on its success: In March 2013, Aer Lingus turned a profit of €61m better than initial forecasts largely because its long haul revenue was up 11 per cent year-on-year. However, the short and medium haul business performed poorly seeing declines in RASK. 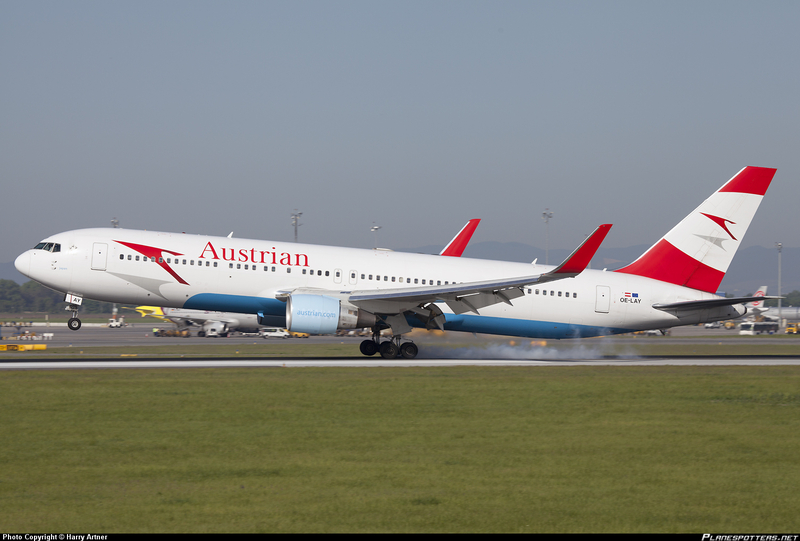 Management at Austrian know that ultimately, the long-haul operations to New York, Newark, Chicago, Toronto, Bangkok, Male, Delhi and Beijing could become profitable for them. They have a new business class product that has been generally well received and have retrofitted their B767 and B777 fleet in economy class. The problem is that it is allied to a hub-and-spoke strategy based in Vienna. They bring passengers in from secondary airports and other cities and rotate them through Vienna on long-haul. The second leg to Austrian’s marketing strategy is to focus on Eastern Europe, Russia and the Near and Middle East. It’s a no brainer to realise that for the short to medium term, this is a weakness for the airline given geopolitical instability in these regions and cannot be guaranteed to be a cash cow for the airline. This would be decision taken ultimately by LH Group but if the numbers don’t add up, this may be the only option. What would stand in the way of such a move would be political pressure from the Austrian government keen to maintain a flag carrier and anxious not to foot the bill for mass redundancy. LH Group could of course continue to operate the routes vacated by Austrian’s exit – especially on intra-European and long-haul to the US – rehiring some of the laid off staff. They could also divert traffic through Munich – which in reality is a direct competitor to Eastern Europe for Vienna. Both Emirates and Turkish Airlines could easily take over Austrian’s Asian and Middle East routes. The customer would not be worse off in terms of choice but the politics and optics would be messy indeed for the Austrian government and LH Group. Moreover, the airport authority has opened a brand new terminal catering to Austrian and other star alliance carriers and it’s not obvious that LCCs would want to pay the airport for the additional comfort that the new terminal offers. If Budapest is any guide, the LCCs would baulk at it completely. Austrian Ground Services, Celebi, Menzies and Austroport – three of the check-in and ramp service providers may find margins tougher to get from an array of LCCs who may take up the slack. Then there’s DO&CO too, Austrian’s caterer. They would lose out if Austrian Airlines goes bust. This is tricky. The evidence on success here (from a regulatory perspective) is mixed. The EU would have to investigate and adjudicate the request. Recent decisions on State Aid to Czech Airlines and LOT Polish Airlines suggests that (i) if the subsidy is offered on conditions not far from those that could have been found in the capital markets and (ii) it is associated with a credible restructuring plan, the EU may give it the green light. On the other hand, Malév’s state aid was ordered to be paid back leading to its exit from the market in 2012. While the most famous EU cave-in was in 1994 when the EU allowed Air France to be subsidized to the tune of 2.3bn Euro, times have changed since then and regulators confront a much more competitive landscape and so allowing an airline to fold does not mean that routes would disappear since numerous airlines could step in to operate them. In short the ‘public interest’ argument for maintaining a national airline is weaker today than it was in the 1990s. At the Supervisory Board meeting in October, Austrian Airlines management will present a range of alternatives that may include all (or some) of these four suggestions. We’ll see what emerges. NextCan airlines find their Sweet Spot?